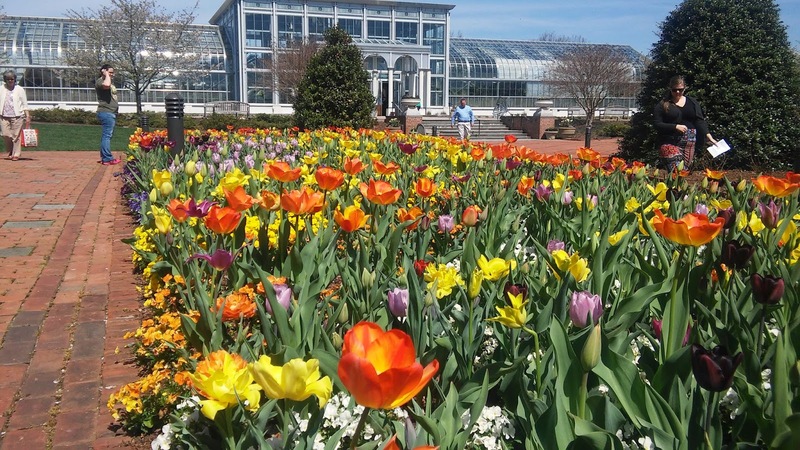 Jared Unzipped: The Lewis Ginter Botanical Garden... and Perhaps a Concussion. The Lewis Ginter Botanical Garden... and Perhaps a Concussion. Today was all about an unexpected adventure... and a little bit of pain! 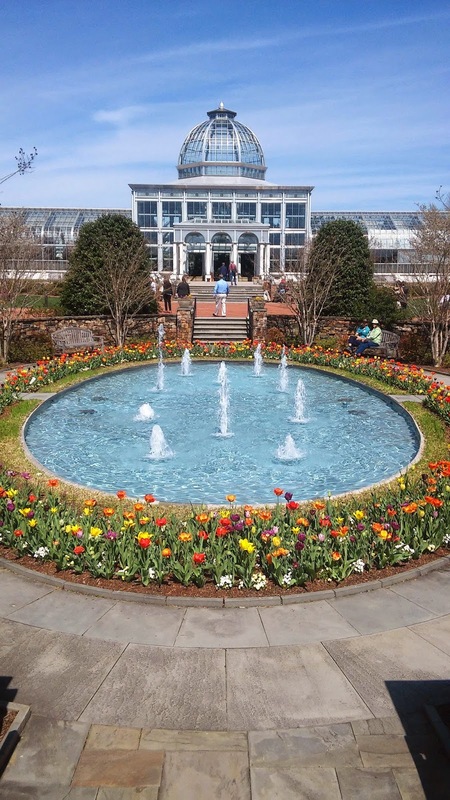 On a whim, Crystal and I decided on short notice to visit the Lewis Ginter Botanical Garden in Richmond, Virginia -- about a three hour drive north from my home. They were hosting a show for the Richmond African Violet Society, to which Crystal is an awesome collector and fan of these wonderful flowering plants. Though, I believe we were in for a surprise treat upon arrival. This Botanical Garden is one of the best I've ever had the joy of visiting. From massive beds of tulips and daffodils to an amazing conservatory filled with tropical palms and orchids, this place had it all! 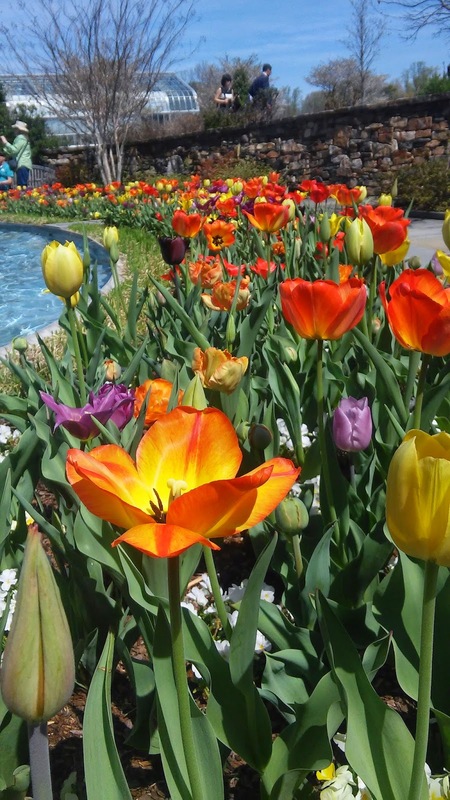 If you ever find yourself in the Richmond area looking for something to do, then head over to the Lewis Ginter complex and enjoy the day. It is mostly child friendly and has a few playground areas. Bring plenty of sunscreen as well -- there's lots of walking and exploring to be had. And now, on to the aforementioned pain portion of the program. Don't worry, it's quite humorous. On our way back from Richmond, we took a break at a truck stop to use the restroom. This particular truck stop was remodeling. To provide a restroom to their customers, they had brought in a portable trailer unit. Believe it or not, it was quite clean and inviting inside -- nothing gross or grimey. But, the stalls were tight and cramped, to say the least. On the back side of the door in the stall I selected, there was a pleasant designer frame with various photos of New York City. As I was standing up from being seated on the toilet, I didn't gauge the amount of room I had correctly. I slammed by hard head into the picture frame, cracked the glass and bent the frame's border in half. I kid you not, I believe I nearly concussed myself. Due to the pain, I rocked backwards onto the toilet and evaluated the damage my skull had done. My head was spinning from a deep pain in my forehead. My brain felt as if it were thumping like a drum! Before me hung a severely cracked photo frame. I couldn't believe the damage I did with just my gigantic noggin! After a few minutes, I took my second attempt at getting up, this time tucking my head to the side and dodging the door. Thankfully, I didn't stab myself in the head with any glass! Ultimately, perhaps my little accident was for the best. I've now learned that my head doubles as a secret weapon!